Looking for the Graduate Catalog? Click the catalog dropdown menu located in the upper right corner of this page. Belmont University is a student-centered Christian community providing an academically challenging education that empowers men and women of diverse backgrounds to engage and transform the world with disciplined intelligence, compassion, courage and faith. A comprehensive university grounded in liberal arts, Belmont enrolls over 8,000 students. It is the second largest private college or university in Tennessee and enjoys a reputation for academic excellence. In addition to undergraduate degrees in approximately 90 major areas of study, the university offers master’s degrees in accountancy, business administration, education, English, music, nursing, occupational therapy and sport administration, and a doctoral degrees in physical therapy, occupational therapy, nursing, law and pharmacy. For more information regarding graduate studies, see The Belmont University Graduate Bulletin. The beautiful Nashville campus reflects a long, rich history that dates back to the 19th century, when the grounds were known as Adelicia Acklen’s Belle Monte estate. The antebellum mansion remains and is flanked by university buildings that were erected a century apart. On the way to a class that prepares them for the 21st century, students enjoy Victorian gardens, statuary and gazebos that serve as reminders of a treasured past. Women’s schools preceding the current comprehensive institution of higher learning include the original Belmont College (1890-1913) and Ward-Belmont (1913-1951). In 1951, the Tennessee Baptist Convention founded the second Belmont College (1951-1991) with an initial coeducational enrollment of 136 students. Soon after celebrating 100 years of education on the same campus, the institution became a university in 1991 - culminating a decade of dramatic growth and progress. 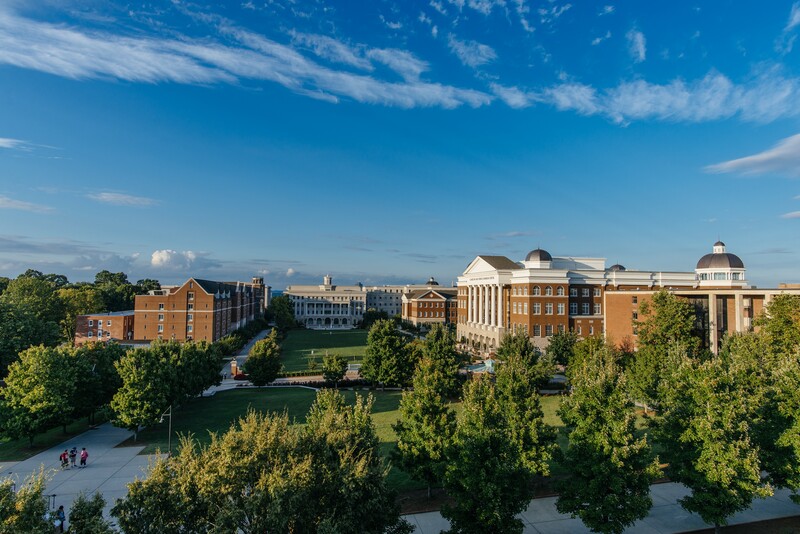 In addition to the many different countries represented in the student body, Belmont University attracts students from almost every state in the United States. The mass of concentrated talent on Belmont’s campus is celebrated when students achieve and faculty committed to teaching are recognized. At Belmont, the education process is ongoing for faculty and administration, as well as students. The institution is committed to listening and learning from everyone. The students of today are helping shape the way students tomorrow will be educated. Belmont University continues on a journey of continuing improvement that assures students who choose to learn and grow in this unique place that they are receiving absolutely the best educational experience possible. Each Belmont student, graduate, faculty member and staff member is making a difference in their world. The university continues to teach people to make a positive, meaningful difference. The success of Belmont’s efforts is grounded in giving students consistent care and attention in a Christian environment. The thinly veiled barrier to a better world is at the heart of the university’s vision to provide a foundation of liberal arts with an emphasis on professional education. The world desired for Belmont students is a better place because they live the difference between just knowing and using real knowledge to make progressive changes. Our vision, mission and values jointly known as the university’s “governing ideas” distinguish us as a university that seeks to serve students from diverse backgrounds within a Christian community. These ideas honor our past, define our present, and describe our future. The statements honor our past by building upon the principles of academic excellence, Christian community, and service to others that have long been the hallmarks of a Belmont education. Our present is defined, by our governing ideas, in proclaiming the student-centered nature of a Belmont education, the ends to which we at Belmont engage in the experience of teaching and learning. Finally, our governing ideas enhance our future because our work to achieve this high calling is continual. As a Belmont University family of students, faculty, staff, and board, we value honesty, mutual respect, and listening and learning from everyone which is the foundation that ensures our efforts to build the promising future that is uniquely Belmont’s.